There are two sides to Trent Reznor. There's the ferocious and raw power of a man flaying away at his own demons and spitting with disgust on the world placed both within and without. And there's the contempletive, often melancholic man who takes a more subtle approach at analyzaton and creation; an approach that twists the emotions more subtley. 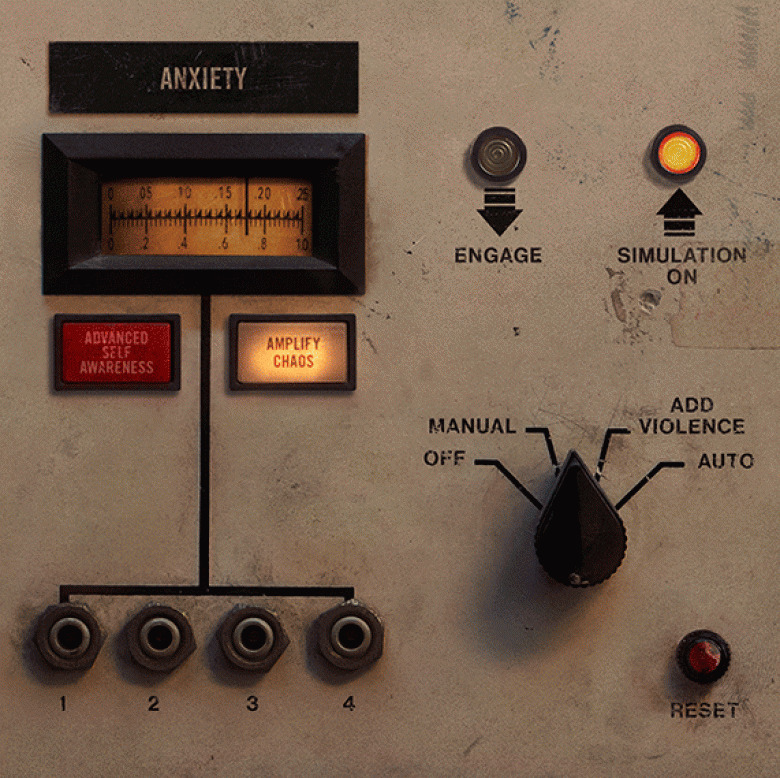 This year, Nine Inch Nails has released two EP's. The first, "Not the Actual Events," appeals more to the unbridled anger and rage of the early stages of Reznor's Nine Inch Nails career. Fans of early albums, like "Broken," "The Downward Spiral," and "The Fragile," found a home in this new EP. It was a great return to early form after Reznor's long stint, I would argue since "Year Zero," of exploring more digital landscapes and a more subdued sound, including his soundtrack work. Not to say that that later period was lacking in any way, in fact, some of Reznor's best work in my opinion, especially the soundtrack to "The Girl With the Dragon Tattoo," and "Year Zero," came out of this period. That brings us to the second and newest EP released this year, "Add Violence." It's a decent EP, full of brooding and driving electronic beats and a (fairly) even mood. After adding previous album and soundtrack collaborator Atticus Ross as a full time band member, the overall sound of this new EP isn't really a surprise. The issue is that after the powerhouse and surprise that was Reznor's last EP and the abundance of soundtrack work he's doing, it's hard to really embrace this new EP as a distinct separation from all of that superior soundtrack material. Opening track "Less Than," is the most accessible song on the EP, in the same vein as previous singles like "The Hand that Feeds" and "Survivalism." It's a driving, rocking track with a memorable hook and some classic Trent snarl. This track, along with "Not Anymore," are the real rage driven tracks here that call back to the last EP. "Not Anymore" had grinding, thunderous bass that absolutely roars, with the Atticus Ross driven electro-industrial beat behind the real, and it really picks up during its choruses, where Trent lets loose and screams in a way that classic fans will love, including myself. The rest of the track fall into hypnotic soundscapes of Reznor's soundtrack work, especially the aforementioned "Dragon Tattoo." The track "This Isn't the Place" was a great return to the tick tock ambience and lovely piano of that soundtrack, and it was easy to get lost in and find yourself swept up in. The track, "The Lovers" takes a more electronic and glitch sound approach to this formula, and harkens back to the "Year Zero" track "Zero-Sum" with Reznor having a spoken monologue behind the music. It worked alright for me, but where as "Zero-Sum" was dark beyond belief and full of that sense of falling apart and impending doom, "The Lovers" is a bit more upbeat, which took away from the vibe I was looking for. The last track, "The Background World," is almost a compromise between the previously aforementioned tracks, with the lovely piano and a midtempo march that pushes along with another great backing bass track. The beat is solid and the spacey vocals are as well, but the issue here is that the track finds a beat and repeats it continuously and piles on more noise until the track disintigrates into a massive wall of static. Normally I find this appealing...just in a smaller timeframe. The track runs eleven minutes and the repetition begins at around the four minute mark. If it had only been a few minutes of breakdown, I would have been a much bigger fan of the track. Instead, it feels more like a bit of wasted time running for that long. All in all, this is a decent EP from Reznor. Fans of his post 2007 work will really find a lot to enjoy here, and a few track give the aggression of his early Nine Inch Nails Records, like the "Not the Actual Events" EP did. But I firmly take a middle road stance here. I find Reznor's soundtrack work more appealing than the crossover sounding tracks on this EP, and the aggressive tracks worked much better on the "Not the Actual Events" EP. Every track here is good, just not as great as I wanted them to be.